All together, there are 26 different female and non-binary creators set to work on 24 different books in March, the same number of creators as in February though spread across 3 fewer books. This is a very ho-hum showing for DC Comics, who appear to be trapped in a bit of a rut. The bulk of the creators listed above have regular gigs at the publisher and should be back next month, which is great. Having a solid, consistent base is an important first step. The trouble is that a) these ranks don’t seem to be growing much, and b) more transitory gigs like fill-in issues, oneshots, and variant covers have been few and fleeting. Speaking of this consistent base, there is no one listed above that we haven’t seen at DC over the previous few months. There are a couple of returning favourites who’ve been away for a little while, like Paulina Ganucheau pitching in with a variant cover and Vita Ayala co-writing Supergirl for what should be a great issue that introduces a new non-binary character. Everyone else is the usual crowd. Doing great work on great books, of course, but the ranks aren’t growing. In terms of characters, after the “Young Animal” oneshots last month, the whole line is relaunching this month with new #1 issues and some revamped titles. Mother Panic will become Mother Panic: Gotham A.D. while Shade, the Changing Girl has grown into Shade, the Changing Woman. We’ve also got a new mini-series spinning out of those oneshots with Eternity Girl. All three books have female leads and a variety of female creators in the mix. The handful of other new releases for March across the line seem rather dude-centric. All together, DC’s spinning their wheels a bit when it comes to female and non-binary creators. The numbers aren’t growing, and they remain far below the highs they hit in the recent past. Stagnant numbers across the line also combine with the publisher’s hyping of their “New Age of DC Heroes” books, eight new artist-centric series that feature barely any women or non-binary creators at all. It’s a bad look for a company that’s not doing very well with representation to begin with. Wonder Woman Annual #1 Review: A Delightful Assortment of Tales! I am about to reveal important details from this very enjoyable comic book! Do yourself a favour and go buy it now! The first story is “And Then There Were Three” by Rucka and Scott. It was nice to have them back together after their stellar “Year One” run, and it was also great to have Rucka writing Batman and Superman again. He’s done fantastic work with both characters in the past, and in his hands they just felt right. DC’s trinity has been a little off kilter for me since the New 52 relaunch in 2011, and Rucka writing all three of them took me back to the characters as I know them best. While the story tied into “Year One,” it didn’t have anything in the way of surprising revelations or information that added a key piece to the larger mysteries that have swirled throughout the “Rebirth” run. It was tangential, the story of Wonder Woman’s first meeting with Batman and Superman, but wow is it good. There are no big fights or drama, just great banter and a perfect distillation of their group dynamic. Superman teasing Batman is a dang delight, Alfred and Lois Laneare in the mix and amusingly so, and the end of the story, with Batman in awe of the pure heroism and love for the world at the core of Wonder Woman, is a great moment. Plus it’s absolutely gorgeous. I wish Nicola Scott could draw Wonder Woman forever, and that Romulo Fajardo Jr. would be her eternal colorist. Scott has such a good handle on Wonder Woman, and captures her beautifully. She’s no slouch with Batman or Superman either! The entire story is exquisitely drawn from start to finish, from Metropolis to the Batcave to the Nevada desert, and makes for a wonderful opener to the annual. Up next is “In Defense of Truth and Justice” by Vita Ayala and Claire Roe with colors by Jordie Bellaire. Ayala is an up an coming write at DC, and Roe is fresh off a run on Batgirl and the Birds of Prey. Their story pits Wonder Woman against the forces of Markovia as she works to save King Shark from an undeserved execution. I always love when Wonder Woman defends a villain who, though guilty of various crimes, is being treated an unfairly and needs help. These tales capture the compassionate core of the character, and Ayala and Roe do that well here, with some excellent action in the mix too. It’s a well executed story all around, with a great ending in which Wonder Woman tries to set King Shark on the right path moving forward with the help of one of her aquatic friends. “The Curse and the Honor” by Michael Moreci and Stephanie Hans is just so pretty. The story itself is fine; the location is unnamed, but it looks like Wonder Woman is in a Japanese village, where she gives a warrior who has absorbed vengeful spirits the honourable death he deserves. But the art is stunning. Stephanie Hans always delivers amazing visuals, and this story is no exception. It’s a heavy tale, set in the winter so that Wonder Woman and her red cape appear in stark contrast to her surroundings. The art is lush and pretty, not so much finely detailed as atmospheric and moody. It is lovely all around; bringing in Stephanie Hans on this one was a very smart move from DC. Continuing the Japanese influence, the final story is “The Last Kaiju,” written by Collin Kelly and Jackson Lanzing with art by David Lafuente and colors from John Rauch. As a giant kaiju approached a city on the Pacific coast, A.R.G.U.S. wants to light it up but Wonder Woman swoops in to deal with it directly. After a bit of fisticuffs, she ties it up in her golden lasso and learns that it’s not some mindless monster but a lost and lonely creature. Wonder Woman then defends the creature, flies it to Dinosaur Island where it can make friends, and they all play catch with a giant log. It’s cute and fun and again captured Wonder Woman’s compassionate core. Just like with King Shark, Wonder Woman willingly put herself in harm’s way to defend someone that no one else thought was worthy of defending. That’s always a great message for a Wonder Woman comic, and it’s nicely executed here. All together, this was a pretty swell annual and definitely worth picking up. I came for Rucka and Scott’s take on DC’s trinity, but everything else was enjoyable as well. Plus it was great to see a wide variety of art styles and tones in the stories. It was an eclectic mix that all worked together to celebrate Wonder Woman’s heart and heroism. With the Wonder Woman movie coming just days from now, this is a fitting book to have on the shelves for new or returning fans. All together, there are 26 different female creators set to work on 24 different books at DC this January, 7 fewer women than in December though 1 more book. It’s a dispiriting drop, though not wholly unexpected. A string of strong months is inevitably followed by a drop. If we’ve learned anything in tracking these numbers it’s that it’s an up and down game. And while 26 women is low relative to the past four months, it’s higher than several of the months before that, and above DC’s abysmal start to their “Rebirth” relaunch in which they could barely muster 20 women a month. So it’s a big drop, to be sure, but the end result is a performance that’s fairly middle of the road for DC in terms of the past year. Part of the reason for this drop is a lack of new faces. Everyone above is someone we’ve seen recently at DC, most of them in the same gig as last month, and while it’s wonderful that they’re all back, the numbers grow best when there are new people in the mix in new places. We’re also missing a few books in January; Vertigo’s offerings are pretty slim, including no Clean Room, and Mariko Tamaki and Joelle Jones’ new Supergirl series seems to be taking a month off already. December was also bolstered by a oneshot holiday special, and there are no such festive celebrations scheduled for January. However, we do have a couple of oneshots with female characters and a female co-writer. Killer Frost and Vixen are both set to be part of the new Justice League of America, and they’re getting special introductory issues co-written by Jody Houser. 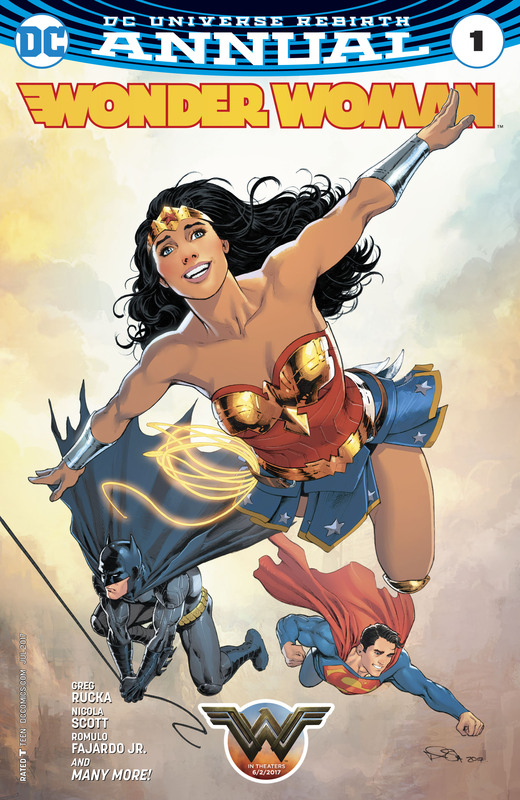 The rest of the new books are fairly light on female characters, though Wonder Woman is co-starring in Batman ’66 Meets Wonder Woman ’77, which should be a blast, and she’ll be a part of the Justice League/Power Rangers crossover comic, along with a couple of other female members on both teams. Overall, DC looks to be starting 2017 in a rather run of the mill way. They’re down from their 2016 highs but up from their 2016 lows, a decidedly average beginning to the New Year. Hopefully the numbers will continue to grow as the year progresses. The January solicits were pretty quiet, and with a second round of “Rebirth” on the way we might see some shake ups in the creator ranks very soon.